Tooltech Ship Design is a strategic business unit with capabilities covering basic to detailed design of vessels which range from RORO's to Cruise Liners, Tugs to Tankers (oil, product and chemical)Design and analysis support to various marine equipment and system suppliers. 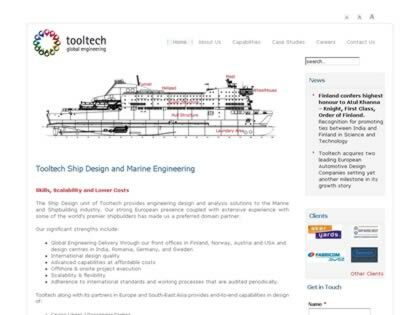 Web Site Snapshot: If available, above is a snapshot of the Tooltech Ship Design and Marine Engineering Services web site at http://www.tooltechshipdesign.net as it appeared when this site was added to the directory or last verified. Please Note that Boat Design Net has no involvement with the above web site; all content and images depicted in the above thumbnail are the property and copyright of Tooltech Ship Design and Marine Engineering Services unless otherwise noted on that site. Description: Tooltech Ship Design is a strategic business unit with capabilities covering basic to detailed design of vessels which range from RORO's to Cruise Liners, Tugs to Tankers (oil, product and chemical)Design and analysis support to various marine equipment and system suppliers.